A married couple preparing to celebrate the husband’s hugely anticipated final art show receives shattering news that promises to forever change their lives. 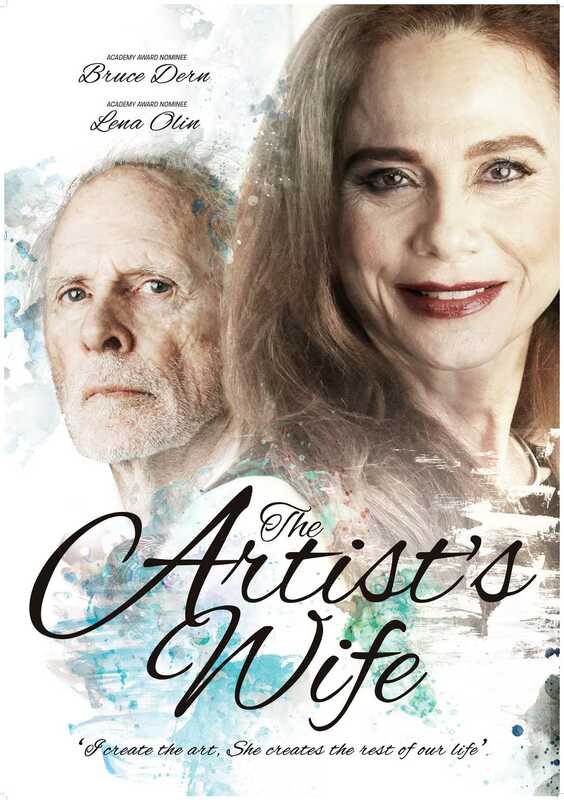 Combining aspects of 45 YEARS, STILL ALICE and THE WIFE and powered by a mesmerizing performance from Lena Olin, THE ARTIST’S WIFE is very relevant in today’s world of female empowerment. Bruce Dern Two-time Academy Award ® nominee. Dern’s revelatory performance in Alexander Payne’s NEBRASKA earned him a Best Actor nomination at the Academy Awards®, the Golden Globes, and the BAFTAs, as well as a Best Actor Award from the Cannes Film Festival and the National Board of Review. Other notable recent performances include Quentin Tarantino’s films THE HATEFUL EIGHT and DJANGO UNCHAINED and Patty Jenkins’ MONSTER. His memorable portrayal of Frank Harlow on the HBO hit BIG LOVE earned him an Emmy nomination as well as a new generation of fans. Dern received his first Academy Award® nomination for his heartbreaking performance as a Vietnam vet, playing opposite Jane Fonda in 1979’s COMING HOME. Lena Olin Academy Award ® nominee (THE DEVIL YOU KNOW, THE HYPNOTIST, NIGHT TRAIN TO LISBON, CHOCOLAT, and TV series RIVIERA and ALIAS). Olin received an Academy Award® nomination for ENEMIES, A LOVE STORY. On television’s ALIAS, Olin portrayed the iconic Irina Derevko, for which she was nominated for an Emmy. Lena Olin’s English language film debut was THE UNBEARABLE LIGHTNESS OF BEING, in which she starred opposite Daniel Day-Lewis. This breakout role led to international fame, and Olin went on to work with directors such as Stephen Daldry (THE READER), Sidney Lumet (NIGHT FALLS ON MANHATTAN), Roman Polanski (THE NINTH GATE), Sydney Pollack (HAVANA), and Lasse Hallström (CHOCOLAT). Avan Jogia (hit TV comedy VICTORIOUS, ABC drama TWISTED, a performance which earned him two Teen Choice Award nominations. Upcoming films include SON OF SHAFT, opposite Samuel L. Jackson). Stefanie Powers (known for her legendary roles in the long-running television series HART TO HART and MCCLINTOCK. Powers is a People’s Choice Award winner, a five-time Golden Globe nominee, and a two-time Emmy Award winner). Claire, happily married to famed artist Richard, notices changes in her husband’s behaviour as his final art show approaches. When Richard is diagnosed with Alzheimer’s disease, Claire and her husband find their bonds thoroughly tested. Her husband’s struggle to stay connected to who he once was is frightening, heartbreaking, and inspiring. Producers: Mike S. Ryan (JUNEBUG, CHOKE), Tom Dolby, Abdi Nazemian (Associate Producer CALL ME BY YOUR NAME) Susanne Filkins (Associate Producer CALL ME BY YOUR NAME).